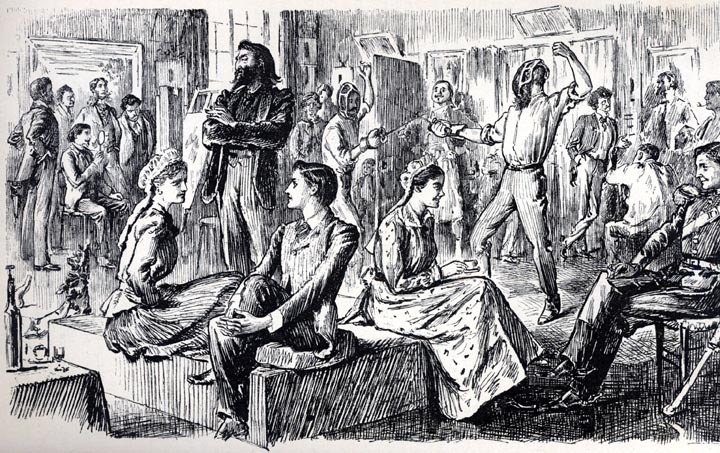 All as it used to be by George du Maurier. 1894. Wood engraving, 13 cm high by 20 cm — illustration for Du Maurier's own Trilby as serialised in Harper's New Monthly Magazine, 88 (March 1894): 575. Scanned image and text by Philip V. Allingham. Paris and bohemian rebellion: the French ateliers and radical art. • Octave Tassaert (1800-74) The Artist’s Studio, 1848. • Gavarni, No2. in the series The Artists, 1838. • Thomas Couture (1815-79) The Realist (1865), oil on canvas National Gallery of Ireland. • Paul Cezanne (1839-1906) The Stove in the Studio c.1865-70 Oil on Canvas National Gallery London. • “The ordinary mania of young artists to wish to live outside their time, with other ideas and customs, isolates them from the world, renders them strange and bizarre, puts them outside the law, banished from society; these are today’s Bohemians.” Felix Pyat 1834. • Henri Murger, Scenes of Bohemian Life (Scénes de la vie de Bohème), instalments 1845, book 1851. • Puccini’s opera, 1896, La Bohème. Manet: born in 1832, father a magistrate and Chevalier of the Legion of Honour; mother Eugenie was daughter of a sometime Vice-Consul to Sweden. At school he was dubbed backward despite his obvious talent for art and gymnastics. Failed entry exam for Naval College then enrolled in the Merchant Marine. 1850 enrols at studio of Couture where he studies for 6 years. • The Impressionist group were initially opposed to the stuffy regime of the Ecole and the assumption that mythological subject matter and correct drawing were the only way forward for an artist. • Cabanel and Gleyre were particularly criticised. • 1887-8 Law studies in Paris leading to clerk’s job in Saint Quentin. • 1889 Morning drawing classes. Paints first studies, copies old prints. • Paints out of doors for first time with tutor Emmanuel Croizé. • By end 1890 Matisse and 2 colleagues had rebelled against the local art master feeling that Croizé had been badly treated. This meant that when they sought to leave the local classes and move on to Paris they did so without the usual official blessing. • 1891 moves to Paris to enrol at Ecole des Beaux Arts. Bouguereau recommended “modelling in twenty lessons” at the Académie Julian. The course cost 306 francs and was seen as a way into the Académie des Beaux Arts. • Rodolphe Julian offered basic facilities and occasional visits from tutors. By this time the studios were at 31 rue Dragon on left bank. • Feb 1892 takes the entrance exam and fails. Pass rate was only 1/3rd. • Meets Gustave Moreau and unofficially sits in on his classes drawing from antique. Takes evening class at Ecole des Arts Decoratif. • Feb 1895 finally passes entrance exam. • 1895-6 officially joins Moreau’s class. Things initially go well: Salon de Sociéte des Beaux-Arts hangs 4 of his paintings. Elected Associate Member of Sociéte Nationale. • Returns to Ecole des Beaux Arts but is asked to leave when the new man in charge discovers he is over 30. • Returns to studies with Eugène Carrière where Matisse acted as “massier” ie registrar/janitor. As a result there were no fees. • Also attended free municipal evening class. Starts sculpture work and works as a labourer in the decoration of the Grand Palais for the 1900 Universal Exhibition. His own painting was rejected from the show. • In the meantime Matisse had two children (1894 and 99) and a wife (1898). She ran a hatshop. Third child born 1900. • In 1899 Matisse bought works by Cezanne, Gauguin, Rodin and van Gogh. • 1900 classes with Antoine Bourdelle, sculptor in Montparnasse. • 1902 as Matisse takes up etching, his family is plunged into crisis by a legal and financial scandal. • 1904 first one person show. • Serialised in American Magazine Harper’s Monthly 1894. Published thereafter and a huge success in US and worldwide. • Trilbymania took hold for 2 years. A stage play opened in New York and was revised by Du Maurier for the London Stage. The book was endlessly parodied: eg Drilby Re-versed, Twillbe, and Thrillby: A shocker in One Scene and Several Spasms. • Film versions in 1913, 1923, 1931, 1954, 1983. • 1906 recording of Sir Herbert Beerbohm Tree as Svengali. With accompanying photographs of Tree as Svengali, Dorothea Baird as Trilby from his production of George Du Maurier's famous novel "Trilby". Sturgis A and others (2006) Rebels and Martyrs, the Image of the Artist in the Nineteenth Century, National Gallery, London. Spurling H (2006) The Unknown Matisse: v. 1: Man of the North: 1869-1908: Man of the North: 1869-1908 v. 1, Penguin. Krell A (1996) Manet and the Painters of Cotemporary Life, Thames and Hudson.